Seven subway tunnels are flooded. Update, 11:54 a.m.: Bloomberg says bus service could be back up by tomorrow afternoon. Update, 10:53 a.m.: East River bridges are now open, via NY1. As residents and officials survey the damage to New York City this morning, one thing is clear: it is the worst mass transit crisis in city history. "The New York City subway system is 108 years old," MTA chairman Joseph J. Lhota said in a statement last night, "But it has never faced a disaster as devastating as what we experienced last night." Seven subway tunnels were inundated, Lhota said. 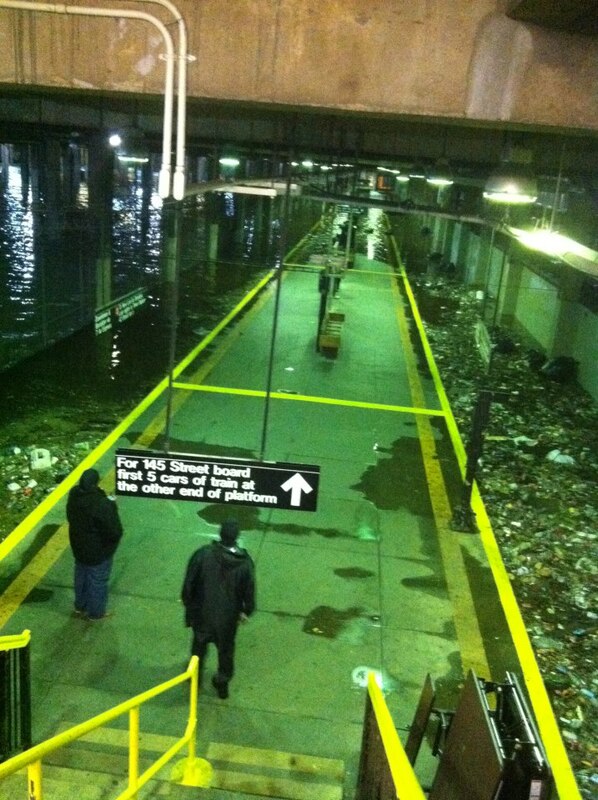 Photos showed flooding in stations from Bay Ridge, at the foot of Brooklyn, to Harlem, in Upper Manhattan. The PATH station connecting Lower Manhattan to New Jersey also flooded, Kubrick-style, as did the World Trade Center construction site. According to New York Times reporter Jodi Kantor, Lhota told CBS the situation was worse than the worst case scenario the MTA had envisioned. There have been rumors the system could be down for a week, but the MTA has refused to speculate about a timeline. "We have to examine the entire 600 miles of subway track before we consider even turning it back on," the MTA told the Weather Channel. The New York Times predicts that given the height of the storm surge, the tunnels of the F, 2, 3, 4, 5, A, C, and R trains may be fully flooded. It's unclear how long it would take to pump them out. This morning the MTA confirmed that the Brooklyn-Battery Tunnel is flooded from end to end (top image); the Queens-Midtown Tunnel has also taken on water. The Metro-North commuter rail system has lost power on two lines. Six bus garages are out of commission due to high water. The Long Island Railroad was forced to evacuate the West Side Rail Yards and at least one East River tunnel suffered flooding. The worst damage to buildings can be found on the shores and barrier islands of Long Island and New Jersey, as well as in Manhattan, Staten Island, and Connecticut. This morning, residents and responders are dealing with crises in Atlantic City, which was 70-80 percent underwater even before high tide, Breezy Point, Queens, where more than 50 buildings had burned, and Fire Island, a barrier island off Long Island's South Shore where at least 17 people tried to weather the storm. But the damage to the city's infrastructure will ensure that even once power comes back on, things will not go back to normal right away. More than 30 percent of New Yorkers, or 2,686,406 people, use mass transit to get to work. All bridges and tunnels connecting Long Island to the U.S. mainland were closed. The Lincoln Tunnel was the only artery to Manhattan that remained open during the storm.